1. Preheat the oven to 180°C, gas mark 4. Grease and base line a 900g loaf tin. Put the grated courgettes onto a plate lined with a few sheets of kitchen paper. Top with more paper and another plate and leave to drain. 2. Using electric beaters, cream the butter and sugar together in a large bowl until creamy. Gradually beat in the eggs, followed by the vanilla and ricotta. Mix the flour, polenta, baking powder, bicarb and ¼ tsp salt then sift into the bowl and fold in with a spatula or large metal spoon. Finally fold in most of the lemon zest, the grated courgettes and leaves from a few stalks of lemon thyme. 3. Spoon the mixture into the loaf tin and bake for 1 hour until risen, golden and a skewer inserted into the middle of the cake comes out clean. Place on a wire rack and leave to cool in the tin. 4. 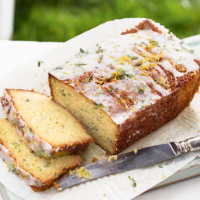 Mix the lemon juice with the icing sugar and a sprinkling of thyme leaves. Spoon the drizzle over the cooled cake, scatter with the reserved lemon zest and leave to set. Slice and serve.